Glamour, couture, and old Hollywood: it’s a wish list for many vintage brides. But finding a dress with all of those features and at an affordable price? 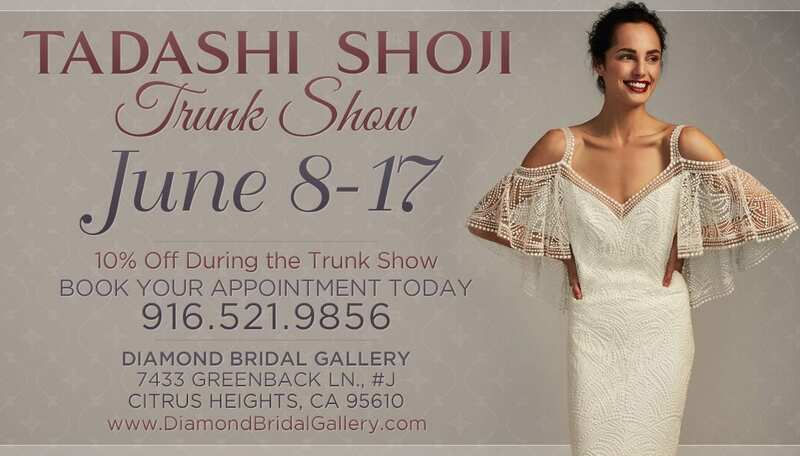 The Tadashi Shoji June trunk show at Diamond Bridal Gallery offers brides a chance to look at a collection with all of those features, and more. Tadashi Shoji, the genius and designer behind the collection, takes inspiration from his early days painting in his native Japan and working with the renowned contemporary artist, Jiro Takamatsu. While all gowns are priced under a thousand dollars, making them highly affordable, you wouldn’t know it to look at them. Rose lace is couples with netted illusion sleeves for an updated Gatsby-inspired gown. Playful tea length dresses are classic vintage, with banded lace and chiffon. Tiered layers of chiffon and crochet lace make a second appearance in an off-the shoulder mermaid gown with a sheer bottom skirt. There’s also plenty of couture elegance, from the swirled-lace long sleeves of the Esmaralda gown to a sleek ivory sheath paired with a floor length cape, inspired by crystal chandeliers that would have made Gatsby proud. Interested? The show runs June 8th through the 17th, and appointments can be made online or by calling 916.521.9856.